The design of this responsive rodeo WordPress theme is focused on large visuals, which will let your work do the talking. To lead readers to more posts and pages, there are catchy red buttons in content blocks. A built-in newsletter form can help expand the base of your subscribers, while social media integration will maximize your website reach. There is also a social login option to ease the process of authorization. Whether visitors access your site via a desktop or a mobile phone, content will always be delivered with ultimate focus. Regularly updatable Cherry Framework will keep your online image up to date. It is a feature that can help to fulfill each and every individual and search engine demands and accomplish rank positions in the search. Since clients have faith in search engines, therefore websites that occur in the top of search result will increase the quantity of customers and provide high income. Responsive design means well adjusted to the displays of all dimensions on any device. Responsive design will help your site or blog look equally great on display screen of any type of home pc or hand-held gadget. Parallax is the preferred website development effect, which causes the background as well as the foreground layers shift at diverse speeds. Through the parallax scrolling effect, you can include the impression of intensity to your internet page, consequently exhibiting your information in a more interesting way. Retina Ready design templates are the perfect way to display your high-resolution digital photography on displays with any sort of pixel-density. Retina Ready layouts make all visuals and content appear clearer, brighter, and more colorful. Thanks to Bootstrap, you can make fully responsive web designs utilizing HTML and CSS based layouts for typography, print styles, forms, buttons, tables, and so forth. Portfolio website is a type of website that enables showcasing various items (services, works of art, merchandise, etc). Through a portfolio, you can make your projects jump out. Whilst integrating the portfolio in your website page, you increase the probabilities that the potential customers will be involved with your subject material and in addition come again for more complete study. It actually does a revolution in the area of drag-and-drop functionality. It changes the default WP editor with a visual editor, that is really user-friendly, intuitive and suitable for beginners. With MotoPress Editor, non-tech users and professional web developers alike can develop great websites. It's an image slider that enables you to show information that will be rotate (it flips one picture following the other). There's an easy-to-use interface and a padded format, that is essentially very important considering that it simplifies the process of building every single slide. You don't have to modify them in an photo editing program, such as Photoshop. Additionally, its visual effects are very extraordinary. Can I put low resolution thumbnails of Entertainment WordPress designs on my website for my clients to choose designs? Will TemplateMonster help me to edit my Entertainment WordPress design? TemplateMonster offers you a variety of sources to help you with your Entertainment WordPress design. Use our comprehensive Online Help Center to get the basic knowledge about your Entertainment WordPress design. Our Knowledgebase contains customers questions and most frequent problems. Anyway, you can always use TemplateMonster 24/7 phone support, try our Ticket System or Live Support Chat to get qualified assistance from our support representatives. Can I resell the Games & Nightlife WP theme as is? No, you cannot resell the Games & Nightlife WP theme as is. You cannot resell the customized WordPress design for Entertainment as a template, but you may sell it as a project to your client. Make sure that these charges for Games & Nightlife WP theme have different order IDs. If it is so, contact our billing department. How many applications, programs etc can I use to integrate with the Games & Nightlife WP templates under one extended license? The extended license gives you the right to use the purchased Games & Nightlife WP templates for the integration with one software/freeware/application/CMS/sitebuilder only. In case you would like to use the template with the other application, the other license is to be acquired. I have customized the Nightlife WordPress design theme and would like to protect my content by copyright, can I place Copyright, Mycompanyname.com? After Nightlife WordPress design theme purchase you can put your copyright to the template. But you cannot place a line at the bottom (or any other spot) of the customized project saying "Website design by Company name". Nevertheless, you can place "Customized by Company name". I like the image from the WP template for Nightlife and would like to use it for my advertising campaign, can you send me this image in a higher resolution? No, we can't provide image in higher size or resolution rather than it is on the WP template for Nightlife. We recommend looking for professional images on online photo resources. Is it possible that Template Monster will contact my client which website I made from Template Monster's website Entertainment WordPress design? Yes, our legal department checks licenses regularly. In case we won't find designer's contact information on the site which was made from the Entertainment WordPress design of ours we will contact the owner of the site directly. Will TemplateMonster help me to install my Games WordPress template? Some of our products like osCommerce templates, Zen Cart templates, etc. require installation to operate. Installation services are not included in the package price. TemplateMonster though offers you a variety of sources to help you with installation of your Games WordPress template including installation instructions, some articles with our Online Help Center. Our Knowledgebase contains customers questions and most frequent problems. Anyway, you can always refer to our partners from TemplateTuning.com to install your Games WordPress template for you for a small fee. Can I resell the WP templates for Games I bought the extended license for? No, you cannot resell the WP templates for Games as is. You can only sell them as the integral part of your new product. What is a unique purchase license for WP template for Nightlife? If you purchase the product at a â€˜Unique price' it guarantees that you are the first and the last person to buy this WP template for Nightlife from us. It means that this template has not been sold before and you become an owner of a unique design. After this kind of purchase the template is being permanently removed from our sales directory and is never available to other customers again. The unique purchase license allows you to develop the unlimited number of projects based on this template, but the template should be customized differently for every project. Can I customize the WP theme for Games & Nightlife News? Yes, you can customize the WP theme for Games & Nightlife News to any extent needed. You cannot use a header of the template for one project though, and images from the template for the other project. What is the price for acquiring the extended license for Entertainment WP theme? There is no set price for acquiring the extended license. The price is based on the Entertainment WP theme's unique price for those templates you would like to use for the integration. The price for purchasing license for a single template is half of the template unique price. What is Developers License for Games & Nightlife WP theme? If you purchase a Developer's license, you are granted a non-exclusive permission to use the Games & Nightlife WP theme on up to 5 domains for projects belonging to either you or your client. Can I put a line at the bottom ( or any other spot) of the customized WP template for Nightlife "Website design by Company name"? No, you cannot place a line at the bottom ( or any other spot) of the customized WP template for Nightlife saying "Website design by Company name". Nevertheless, you can place "Customized by Company name". Can I put a line at the bottom (or any other spot) of my new product "Website development by Company name" after purchasing Nightlife WordPress design theme? Yes, you can place a note at the bottom (or any other spot) of my product "Website development by Company name". Nevertheless, you cannot place "Website design by Company name"while using one of Nightlife WordPress design theme. What is Extended License for WordPress theme for Entertainment? Are images included in the WP templates for Entertainment released under GPLv3.0 license? In the WP templates for Entertainment released under GNU GPL v3.0 images are not included and are used for demo purposes only. In what cases I don't need the extended license for WordPress templates for Nightlife? What am I allowed and not allowed to do with the WordPress themes for Entertainment? You may: Build a website using the WordPress design for Entertainment in any way you like.You may not:Resell or redistribute templates (like we do).Claim intellectual or exclusive ownership to any of our products, modified or unmodified. All products are property of content providing companies and individuals.Make more than one project using the same template (you have to purchase the same template once more in order to make another project with the same design). Are there any restrictions for using imagery, cliparts and fonts from the Games WordPress template I purchased? All imagery, clipart and fonts used in Games WordPress template are royalty-free, if not stated otherwise on the product page, and are the integral part of our products. One Time Usage License and Developers License give you the right to use images, clipart and fonts only as a part of the website you build using your template. You can use imagery, clipart and fonts to develop one project only. Any kind of separate usage or distribution is strictly prohibited. 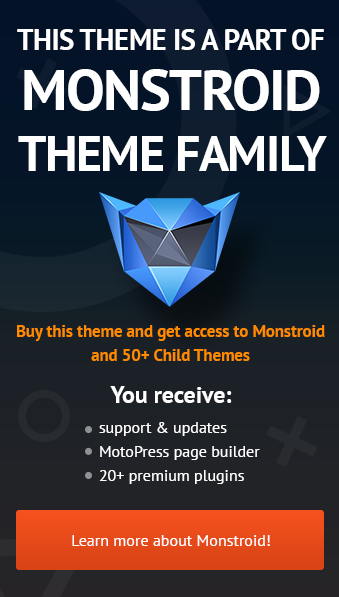 I ordered a Games & Nightlife WP theme but haven't received the download information. In case of not receiving the download information of a Games & Nightlife WP theme, please contact our Billing Department via support chat by phone or e-mail. Is there any return policy for WP templates for Entertainment? Do you provide any scripts with your WP templates for Games or could you do some custom programming? Our templates do not include any additional scripts. Newsletter subscriptions, search fields, forums, image galleries (in HTML versions of Flash products) are inactive. Basic scripts can be easily added to a Games & Nightlife WP theme at www.TemplateTuning.com If you are not sure that the element you're interested in is active please contact our Support Chat for clarification. Can I resell the customized Entertainment WP theme? Yes, you can redistribute Entertainment WP theme under the terms of the GPL as well. Once you understand how Moto Press works it&rsquo;s a really nice theme and the Template Monster Support guys are awesome they really know their HTML/CSS stuff. Note: It works better in two columns for mobile devices I.e. iPhone/iPad and if you want to change the mobile menu background colour from the default white to say red you will need to add custom CSS, part form that it works great for our site. Hope that helps.